Ban Public Transport. Buy Segways. Save the Earth with the help of the Cheeky Girls. This world-changing suggestion starts, as all good things should, with the Cheeky Girls. Or more accurately Lembit Opik, the Lim Dem MP who rose into the public consciousness after getting engaged to one of the Romanian lovelies in a publicity stunt. Recently Mr Opik rode a Segway up and down up and down outside the Houses of Parliament, challenging ministers to have him arrested. Why did he want to be arrested? 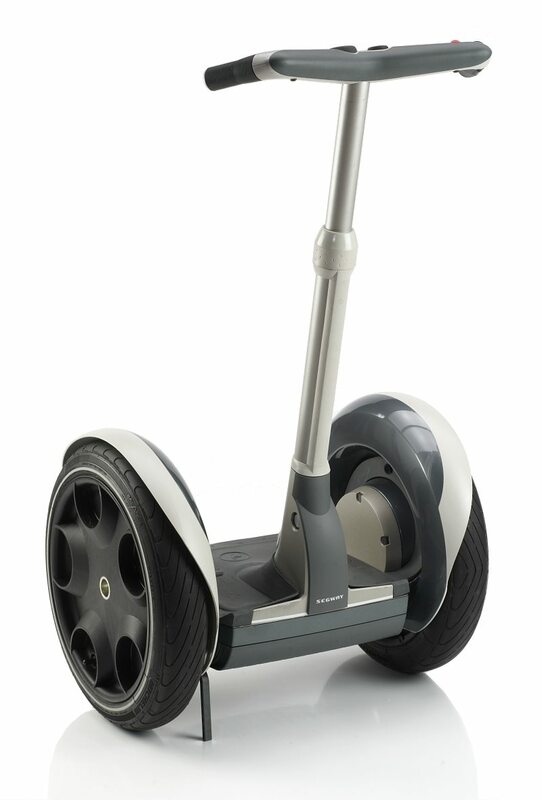 Well currently in the UK, Segways can only be used on private land as they are illegal to use on highways or pavements. However I believe that Segway’s can save the Earth from Climate Change (well a little bit anyway), and I’m going to prove it here. So what is a Segway? Well, if you haven’t come across them, they’re a bit like an electric stand up scooter, carrying one person at 12mph for up to 24 miles. As a guide in the UK, they cost £4,300 including VAT. Hailed as a revolution in transport, they’re yet to catch on in the UK mainly due to their legal status and the still remaining stigma of the Sinclair C5, the last comparable electric vehicle. Segway themselves expected to sell 40,000 of them a year, but in the last 6 years only about 30,000 have been shifted in total. Anyway, back to the point. How much CO2 in g/km is a Segway responsible for? Well, based on an estimated battery capacity of 0.8kwh, a full charge (and range of 24 miles) is about 0.42 kg of CO2, which being a little more realistic with a range of 20 miles works out at 13 g/km. Which is quite impressive if you compare it to taking the Tube (52.6 g/km), National Rail (60.2 g/km), Bus (94.3 g/km) or even the average Car (160 g/km). 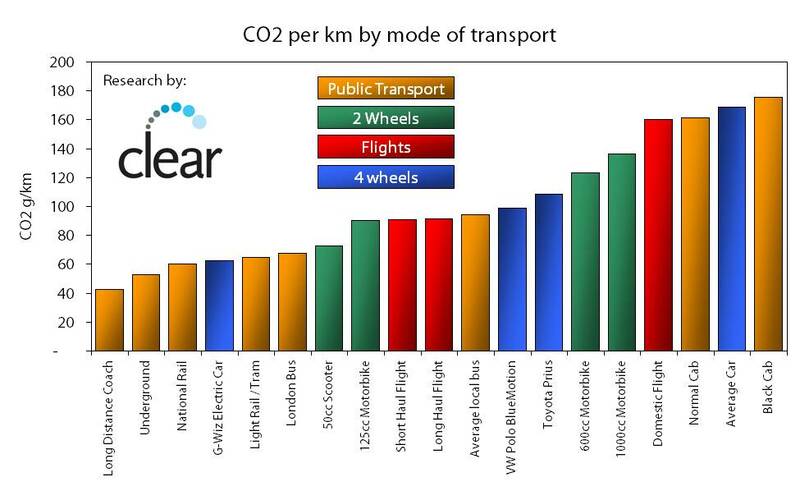 So in carbon terms alone riding a Segway to work would produce less than 15% of the CO2 that taking the Bus does. How about speed? 12 mph isn’t fast is it? Well in London the average bus makes headway at just 8mph, the average tram 16 mph and tube 18 mph. So 12 mph isn’t that bad at all. How about range then? Well, taking a London-centric view again, the Segway would get you from Croydon to the middle of London and back on a single charge which is probably further than you’d actually want to travel. OK then, biggest issue is cost. £4,300 is very expensive for a battery with wheels. Well taking the example of a bus again, let’s say a new one costs £125,000. Well, that would buy you almost 30 Segways. Take into account the cost of driver’s salaries and other running costs of about the same again every year. Assuming you could pick up and drop off Segways at bus stops along the lines of the Velib in Paris (and they were evenly distributed around a city), then realistically after 2 years, you will have paid for a Segway for every passenger (90) on an average bus. So there you go. For a typical London commuter doing an 8 mile commute, a Segway would save about 200kg from their carbon footprint every year. And this beautiful Utopian vision is all thanks to the Cheeky Girls. So you want to reduce your carbon footprint right? But you still have to get from A to B and back again. So what’s the cleanest way to go in terms of CO2? The obvious one is to walk or cycle. Both are essentially carbon neutral, though if you were really being pedantic, you could say that the extra effort does make you breathe a bit harder. But its not a lot. Well, if you’re going a long way and want to cut your footprint, don’t bother with the train. Instead give National Express a call and hop on. And how about occupancy? For example, 2 people on a 50cc scooter would be pretty slow, but at 36 g/km its even cleaner than a coach. 4 people in a VW Polo Bluemotion? Less than 25g/km each. To put that in context, a Bentley Continental GT with 1 person is 410 g/km. 1. Sources of data: VCA car fuel data, www.clear-offset.com analysis, DEFRA, TFL, Going Green. 2. Flight figures do not include any form of radiative forcing index. 3. G-Wiz figure is an equivalent CO2 figure if the electricity is produced from the national grid. 4. All bikes are 4-stroke. Note: This blog is written on behalf of Clear the carbon offset company.